To better glean the underlying trend of job growth, our monthly smoother looks at 3, 6, and 12-month averages of monthly job growth. 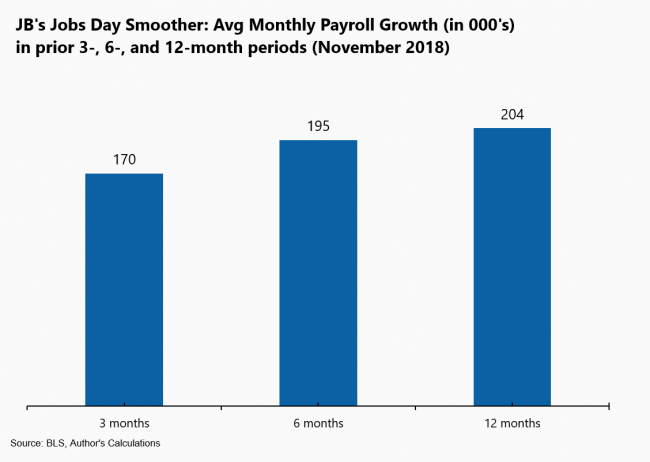 The 3-month average of 170,000 is slightly below that of the 6- and 12 -month averages, suggestive of a slower trend in monthly payroll gains. However, this pattern is to be expected as the labor market closes in on full-capacity. In fact, the 3-month pace (170K), if sustained, is easily strong enough to put further downward pressure on the unemployment rate and thus, upward pressure on wage growth. Moreover, as I note below, I suspect real (inflation-adjusted) wage growth will soon accelerate due to declining oil prices. Wage growth held at its cyclical high reached last month of 3.1 percent, year-over-year, a sign that tight labor markets are giving workers a bit more bargaining clout. The figures plot nominal gains for all private sector workers and for middle-wage workers (blue-collar factory workers and non-managers in services). The six-month moving average shows the recent acceleration from about 2.5 percent through 2017 to around 3 percent this year. But what about real wage growth? Over the near term, real wages and the price of oil tend to be highly correlated. That is, falling oil and gas prices lead to slower overall price growth, which raises real wage growth. 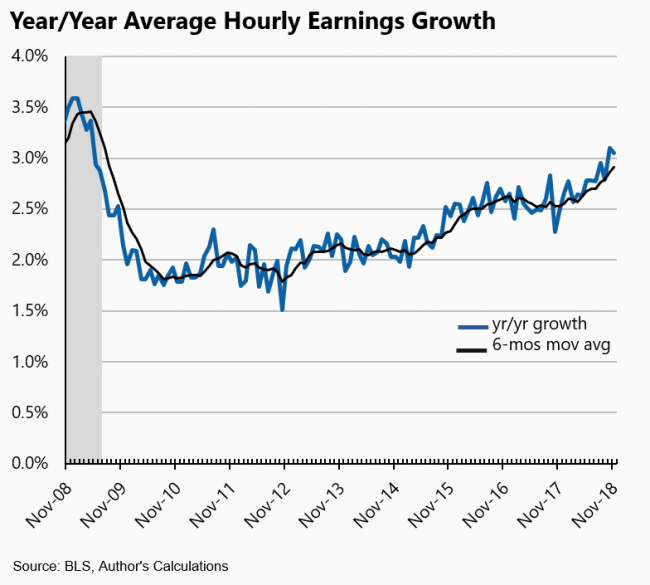 That means we now have two factors helping to boost real wage growth: the tight labor market is generating faster nominal wage gains, and cheap oil is pushing up real gains. Though we do not yet know CPI inflation for November, my guess is that the price index is up about 2.2% over the past year. If that’s correct, it means real hourly wages grew at a yearly rate of about 1 percent, the fastest pace of real wage gains since late 2016. –The closely watched “prime-age” (25-54) employment rate was unchanged at 79.7 percent. However, it was up 0.2 points for men and down slightly for women. Abstracting from the monthly blips, this series, especially for men, shows potential available labor supply, as the men’s rate is still 1.6 points below its pre-recession peak (prime-age women have surpassed their peak). –The black unemployment rate fell to 5.9 percent, tied for an all-time low, but the decline was accompanied by lower labor force participation, so it’s not unequivocal good news. Also, these data are particularly noisy, month-to-month. –Construction employment was up only slightly (5,000), possibly reflecting the slowdown in the interest-rate-sensitive building sector. –Government employment has been flat in recent months, driven largely by state-level declines, possibly reflect state budget constraints, particularly in education. Finally, turning to the Fed, according to recent news reports, the central bank is considering downshifting its “normalization” campaign, meaning pausing between rate hikes more than they’ve heretofore been signaling. Today’s report constitutes a supportive data point in that regard. 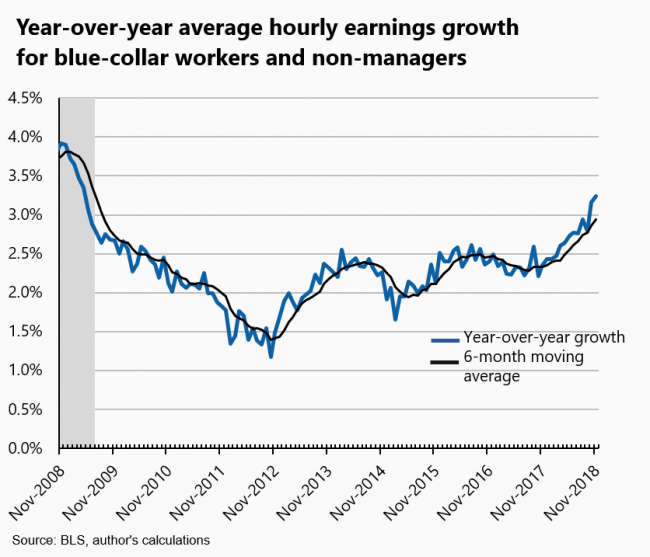 Wage growth is growing but not quickly accelerating, and the trend pace of job gains is off its peak, as shown in the smoother. 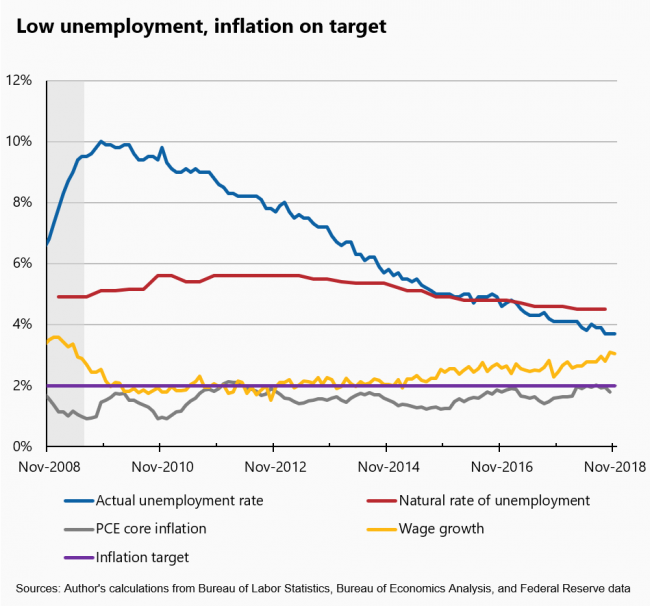 Most importantly, as the figure below reveals, even while unemployment remains well below the Fed’s “natural rate” and wage growth has picked up, their key inflation gauge remains not merely well-anchored but, in its most recent print, slightly below target. Given other recent headwinds, most notably the flattening of the yield curve and the fact that fiscal stimulus is scheduled to go neutral in terms of its growth contribution later next year, the cause for a pause continues to gain momentum. Share the post "Another solid jobs report, even with a slightly slower trend in payrolls"